Your hosts, Gareth and Reinetta Munitich, welcome you to Hastings, Hawke's Bay. 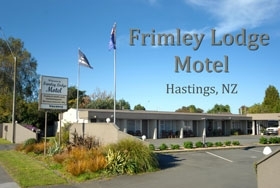 We are passionate about Frimley Lodge Motel, it is our family home and we are committed to providing a quality accommodation service. New Star Rating - 3 Star Plus! Click on the "Been There" Review Icon for validated guest feedback. 12 modern and immaculately clean ground-floor units with door chains and 24hr security camera surveillance for your peace of mind, plus easy drive-in access and off-road parking. 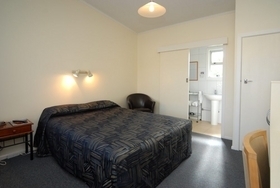 Studio Units, Large Studios, 1 Bedroom & 2 Bedroom Units - Choose from a variety of rooms to suit your travel needs. Corporate travellers and couples can enjoy our refurbished Studio Units, whilst families and groups love the versaitlity of our 1 and 2 bedroom units. Corporate Facilities - Wi Fi and Photocopying services available. LCD TV's in every room with 4 SKY TV channels - Sky Sports 1 & 3, Sky Movies & Nickolodeon for the children. Microwave Ovens in every room for your convenience, including our studio units. Immaculately Clean Rooms - We adhere to strict infection control and hygeine policies to ensure excellent standards. Sparkling blue, refreshing swimming pool - Spend the day relaxing by our pool on clear summer days, or cool off after a long day of activity in the Hawke's Bay Region. Laundry Facilities - A coin-operated washing machine is available for guest use as well as clothes lines and a drier is also available for a nominal charge.